Welcome to Doster Chiropractic! 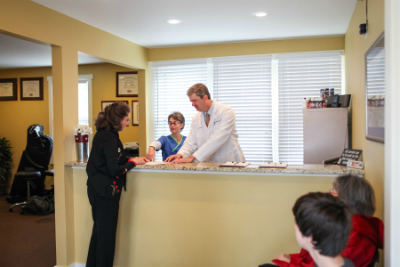 We consider our patients to be part of the family. In our warm and friendly environment, you’ll be greeted with a smile and a handshake, so you’ll feel right at home. We’ll ask that you complete some paperwork before one of our assistants will get some basic information from you about why you’re here and what you’re looking for from us. Your doctor will then come in and find out what your goals are. They’ll get details about what’s going on with you, so they know how to best help you. Some patients only want to get out of pain while others are looking to get healthy. The choice is yours. You can think of Drs. Jarod and Tanya Doster as your employees. You’ve hired them to provide solutions, and that’s precisely what they will do! First, however, you’ll experience an extremely thorough exam. X-rays may be needed if your case is of a more serious nature. Your X-rays will be evaluated thoroughly before treatment begins. Dr. Jarod gives his home phone number to every new patient who comes in. He also does a follow-up call in the evening for every new patient who comes in just to check with them and see how they did following their chiropractic adjustment or treatment. Though we aren’t open on weekends, Dr. Jarod goes above and beyond the call of duty as he is available to treat patients on the weekend at the office. He’s also gone to people’s homes before to treat them. While some practitioners would stop seeing a patient once they start feeling better, Dr. Jarod likes to recheck them to ensure they’re not only out of pain but on the path to better health. Another significant focus at the practice is providing patients with some back strengthening and rehab exercises, so the condition you present with is not something that returns in a few months. We also like seeing patients for regular chiropractic tune-ups. Just as you brush your teeth twice a day, it’s a good idea to have routine chiropractic adjustments. Though we encourage patients to get adjusted on a regular basis, we don’t draw up contracts requiring a certain number of visits. You’ll never feel pressured, only cared for. Discover the difference that our thorough evaluations and care can make when it comes to your health. Contact us today to book an appointment!